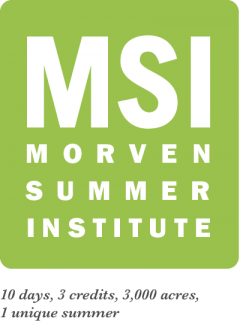 The Morven Summer Institute | 3 credits. 10 days. 3,000 acres. 1 unique summer. The Morven Summer Institute is an innovative summer program hosted on UVA’s 3,000-acre Morven Farm, an emerging landscape for interdisciplinary learning at the University, located 20 minutes from UVA Grounds. At the Morven Summer Institute, undergraduate and graduate students with interests in sustainability, design, food systems, and ecology will have the opportunity to escape traditional confines of the classroom while working on projects with real-world applications. Students participating in the 2019 Summer Institute select one 3-credit course from either (or both) of the 10-day summer blocks (Block A: May 13 – May 24 & Block B: May 28 – June 7). In conjunction with time spent in the classroom at Morven, this interdisciplinary program features guest speakers, field trips, active group discussions, and hands-on projects to ignite creative collaboration among students and faculty. The Morven Summer Institute is a collaborative effort involving faculty from the School of Architecture, the School of Engineering, and the College of Arts and Sciences; the Office of the Vice President for Research; and the Office of Summer and Special Academic Programs. Students from all years, departments, and outside universities are welcome to join the Morven community for this unique program. MSI Course Registration begins April 15, 2019. No application needed, just sign up on SIS! Limited scholarships are available. Click here for more information. Contact Danielle Loleng or Sade Storthz if you have questions.